Senior communities use ALLE Online™ to differentiate their programs to attract prospective residents. 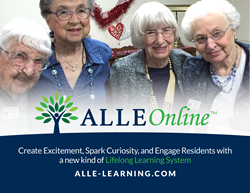 In response to demand for affordable, innovative programs for senior learners, ALLE Learning™, a Phoenix, Arizona-based company, announces the creation of ALLE Online™, designed to provide easy access to the company’s most popular classes. Program leaders can now utilize complete class modules, designed to appeal specifically to senior lifelong learners. Contact ALLE Learning™ for further information or visit http://www.alle-learning.com to initiate a unique, proven learning approach for your senior lifelong learners. ALLE Online™ supports senior communities that seek to improve the quality of life of their residents through innovative programs that are enjoyable, interactive and socially engaging.